A key part of the NoNOISE II restoration bundle, Manual DeClick II Native is an updated and improved version of the legendary restoration technology from Sonic. The Grammy® award winning NoNOISE technology set the standard by which all other restoration tool-sets are judged. Manual DeClick II Native is a precise digital resynthesis technology unlike anything you've ever experienced. 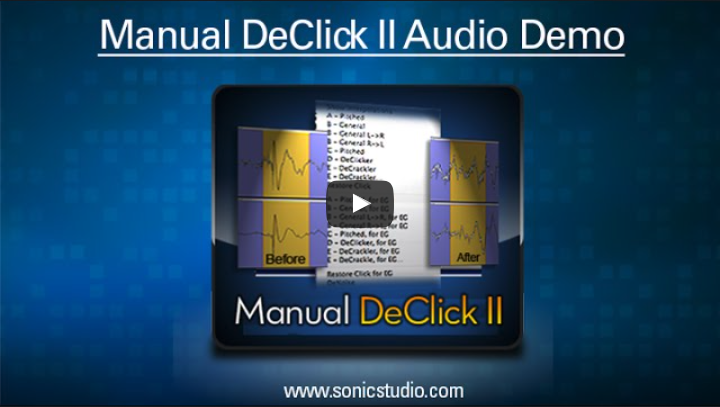 Manual DeClick II operates in the frequency domain, seamlessly repairing audio that you may have give-up for unsavable. 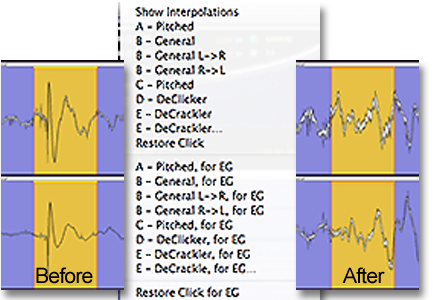 Manual DeClick II Option for soundBlade (HD, SE, LE) comes with optimized modes for focused reconstruction of damaged samples, but it can also be deployed on entire tracks for fast global DeClicking or DeCrackling repairs. There are five repair modes which feature proprietary resynthesis algorithms that manually driven from the traditional time–based timeline of soundBlade. 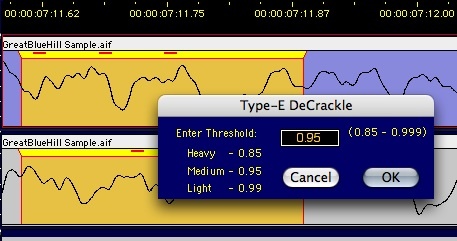 Production DeCrackle, used in the Sonic Studio Process app and licensed with the Manual DeClick II iLok license, is the background or faster than real time version of theType E interpolator.The DeCrackler, both manual and background versions, provide unparalleled distortion reduction for a segment or an entire sound file. The A through D Type DeClickers are designed to operate on time–limited regions of a sound file. The Type E DeCrackle can operate on any length or duration of material. The depth of repair is adjustable, allowing you to tailor the repair to the needs of each job and the results are undo-able at anytime.